Learning is happening in Room 216! Thank you so much for sending eager, prepared students to school. This year is off to a fantastic start--our room is filled with inquisitive, helpful pupils who seem to always take the opportunity to work together and have fun. Our primary means of communication from school to parent is through your student's agenda. The students are being trained to become excellent communicators. The agenda serves multiple purposes. Of course assignments are to be written in the agenda on the days they are assigned. Also, the first three lines at the top of the agenda serve as our reading log. Unless otherwise specified, this reading is student-choice of topic/format. 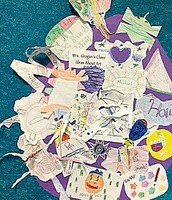 The student is to record the title and chapters/pages read and have a conversation with the parent about what was read. The parent is then shown what other homework there may have been and requested to initial or sign the bottom block of the agenda. The agenda may also be used for the teacher or parent to jot a quick note of concern. Since both of us are looking at the agenda each day, the message should be easily received. Particular concerns or inquiries may also be brought to my attention via e-mail. I try to answer all e-mail within 24 hours. Phone messages may be left by calling the school, extension 24216. Finally, please notice that we have colorful postcard-size notes available for any change of dismissal plans. I have these made to ensure that every note to the office has "Grogan-5th" on it as required and so that the notes are easily noticed in the classroom if our students don't quite get them in the morning message envelope. Notes created on the backs of napkins have a way of blending into our surroundings and not making it to the front office as needed. Thanks in advance for using the post cards to tell us of changes to daily schedules. Thank you to Mrs. Flamm for volunteering as the room copy person and Art class assistant. Her services are greatly appreciated. 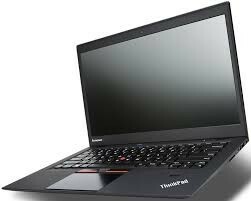 We are excited to announce that 5th grade has been fortunate enough to have additional computers added to our grade level! We are currently working one-to-one in our classrooms. We are confident that these computers will continue to help support our students in the development of timeless and contemporary skills and competencies which enable life long success. 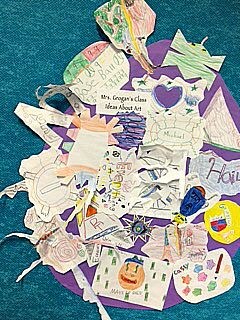 Here is our Art Egg. Ask your student about how they contributed to our IDEA EGG. 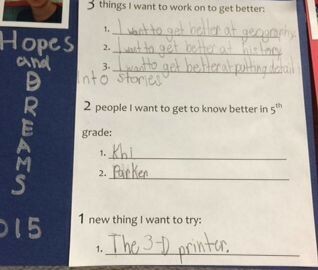 We all have Hopes & Dreams. 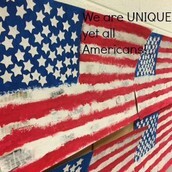 Come to the classroom on Back to School Night to see what your child is hoping and dreaming for this school year. 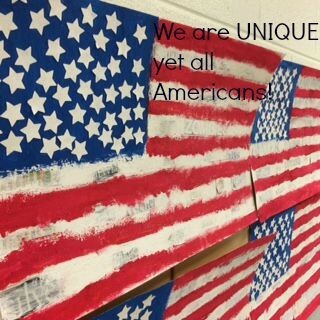 Using Jasper John's collage as an inspiration each student designed his or her flag to show how our identities are unique while we are all Americans. They are currently on display--come see them! 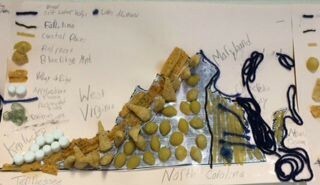 Showing VA's geography through food. Mrs. Morris and I thank you in advance for help with collecting these items. Most of the items are recyclable items from your household:) Please send the items in, as you collect them. All of these materials will be used in our Science STEAM project. I'm certain each of your calendars are filling up rapidly this time of year. Here are a few dates to highlight for school-related events. Every child loves to feel special one day a year. If you so choose, your child may share a treat with his or her classmates on or near his or her birthday. Treats are generally shared from 11:25 - 11:30 am, just before lunch. If you plan to send treats please e-mail me so I can make the time work. Treats must be easily distributed and require no cutting at school. Napkins should be sent in with the treats. There are no stated allergies in our classroom at this time.